Web exclusive! Beautify your outdoor space with a Good Directions Victoria Polished Copper Finial. Its perfect for adding a graceful finishing touch to any rooftop, turret or cupola. 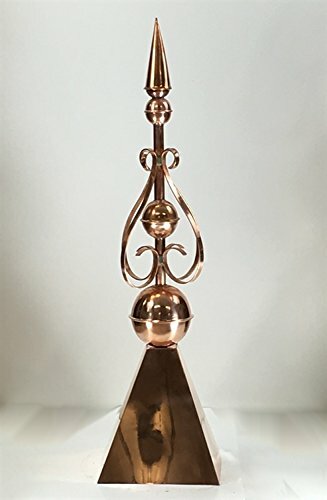 This handcrafted polished copper finial can also be placed in a yard or garden as a topiary or decorative sculpture and is available in 2 different sizes to accommodate your needs. The Good Directions Gawain Finial adds height to your eaves and sets your house apart from the neighbors. This handsome finial attaches easily to your roof with the included steel mounting rod, giving you a perfect way to customize your roof's profile. 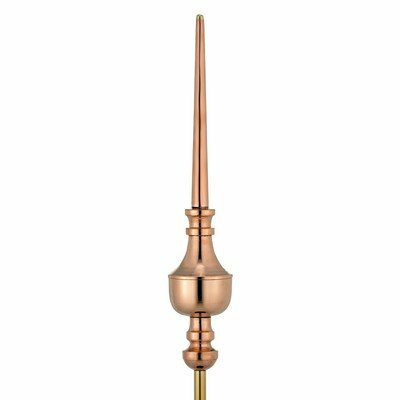 The finial is handcrafted from pure copper and polished to a beautiful shine. Both a 28-inch (Dimensions: 3W x 28H inches) and a 39-inch (6W x 39H inches) tall finial are available. Good Directions got its start by creating weathervanes and cupolas, but it has expanded its line to include a wide range of decorative yet functional products for the home and garden, including popular fire domes, rain chains, and garden weathervanes. The company continues to attract innovative artists and designers eager to lend their vision to the creation of exceptional products to enhance the home, both indoors and out. No matter which way the wind blows, you can count on Good Directions to show you the way to a beautiful home. Made from beautiful polished copper. Steel mounting rod is included. Accents your roofline with style. Choose from a 28- or 39-inch tall finial. 1-year manufacturer's warranty. Web exclusive! Beautify your outdoor space with a Good Directions Lancelot Polished Copper Finial. Its perfect for adding a graceful finishing touch to any rooftop, turret or cupola. 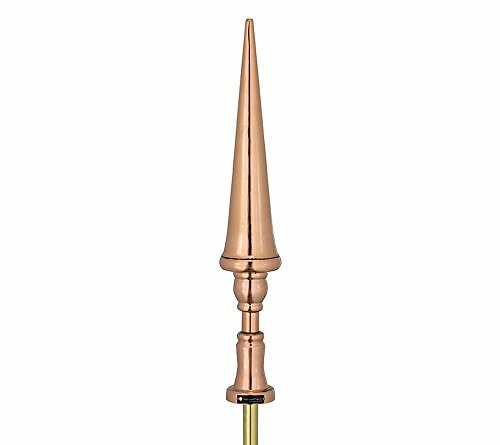 This handcrafted polished copper finial can also be placed in a yard or garden as a topiary or decorative sculpture. Warranty: 3 years from any manufacturer defect. Cupolas are crafted using pvc-vinyl with a black metal roof. Base measures 16" x 16" and 23" in height. Cupolas accommodate up to a 7/12 roof pitch. Web exclusive! Beautify your outdoor space with a Good Directions Castle Smithsonian Polished Copper Finial. Its perfect for adding a graceful finishing touch to any rooftop, turret or cupola. 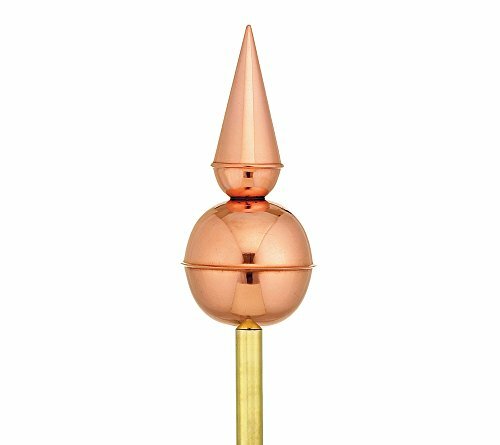 This handcrafted polished copper finial can also be placed in a yard or garden as a topiary or decorative sculpture. Web exclusive! Beautify your outdoor space with a Good Directions Avalon Polished Copper Finial. Its perfect for adding a graceful finishing touch to any rooftop, turret or cupola. 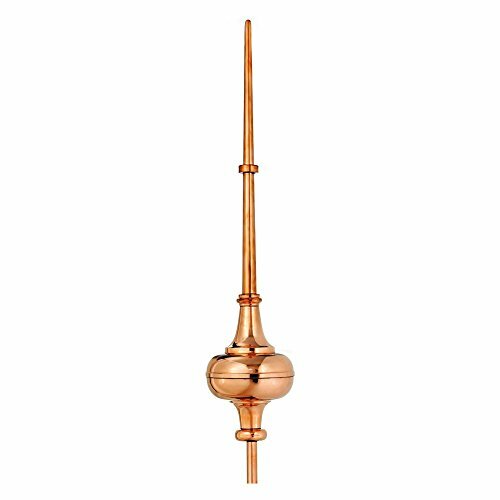 This handcrafted polished copper finial can also be placed in a yard or garden as a topiary or decorative sculpture. Web exclusive! Beautify your outdoor space with a Good Directions Morgana Polished Copper Finial. Its perfect for adding a graceful finishing touch to any rooftop, turret or cupola. 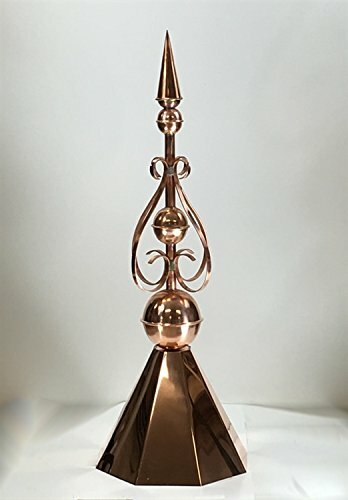 This handcrafted polished copper finial can also be placed in a yard or garden as a topiary or decorative sculpture and is available in 3 different sizes to accommodate your needs. 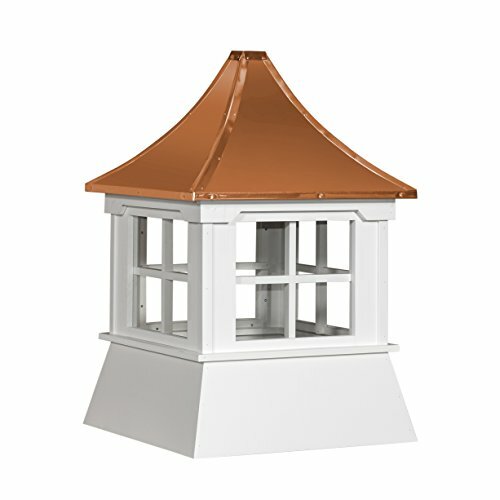 Cupolas are crafted using pvc-vinyl with a copper metal roof. Base measures 16" x 16" and 23" in height. Cupolas accommodate up to a 7/12 roof pitch. 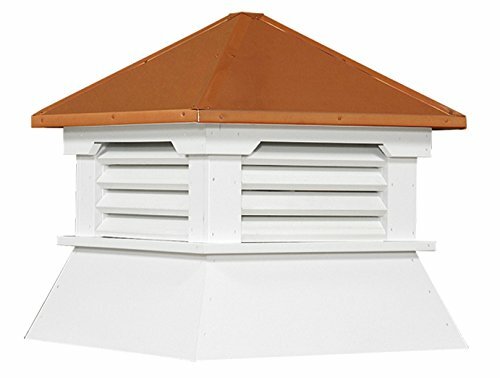 Cupolas are crafted using pvc-vinyl with a copper metal roof. Base measures 16" x 16" and 18" in height. Cupolas accommodate up to a 7/12 roof pitch. 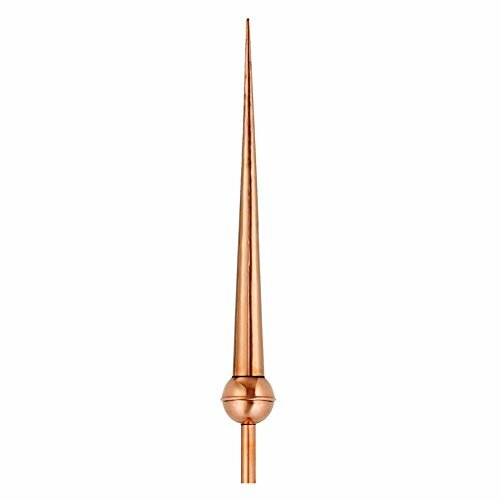 A sleek silhouette and bright copper finish give the Good Directions Victoria Rooftop Finial with Directionals a graceful look to help top your roof with a touch of style. 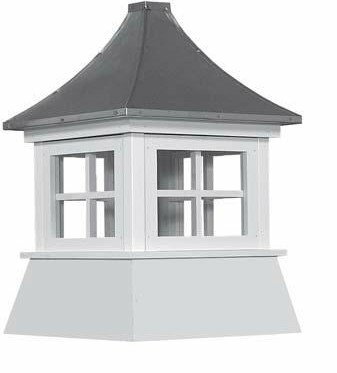 This durable rooftop finial includes directional letters to help you determine which way the wind blows. Enjoy it for years to come thanks to the pure copper and brass construction, along with a supportive steel rod. Good Directions got its start by creating weathervanes and cupolas, but it has expanded its line to include a wide range of decorative yet functional products for the home and garden, including popular fire domes, rain chains, and garden weathervanes. The company continues to attract innovative artists and designers eager to lend their vision to the creation of exceptional products to enhance the home, both indoors and out. No matter which way the wind blows, you can count on Good Directions to show you the way to a beautiful home. Select from available size options. Thin spire top. Constructed from pure copper and brass with steel rod. Natural metal finish. Roof mount required. Brass directionals included. Brand: Good Directions | Manufacturer: Good Directions, Inc.
For centuries, finials have been used as decorative accents on rooftops around the world. This finial is handcrafted from quality materials by old-world craftsman using tried and true techniques. The gorgeous blue-green patina finish creates a natural weathered copper verdigris look with added durability. This finial looks great on almost any rooftop including the roof of a home, garage, barn, shed, gazebo, or office building. It is also an attractive focal point when used in the yard or garden. 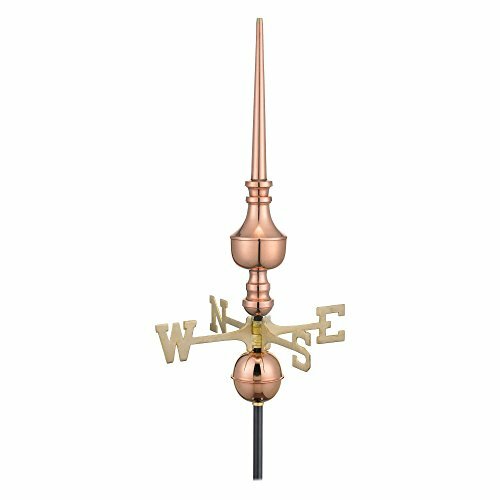 Although originally intended for displaying weathervanes and finials, this powder-coated steel rod has a variety of other uses. Male and female threaded ends offer added versatility. This rod has a 3/4" diameter.